"Jesus, I can't even watch this," the man sitting next to me whispered, fidgeting in his seat. The screen in front of us played a home video of an infant child named Joel Green, gurgling happily as he played with a bunch of golden retriever puppies. It was April, and we were sitting in a darkened amphitheater on the NYU campus during the Games For Change festival. Josh Larson, an artist and game developer, had just taken the stage to give a presentation about his upcoming game That Dragon, Cancer. It tells a deeply personal story about Ryan Green, another member of its small development team, raising his son after Joel had been diagnosed with terminal cancer. Autobiographical work like this is rare in video games, but Green and his co-developers had a compelling idea to structure the story like an adventure game—sort of like Myst, only with less of an emphasis on puzzle-solving. One scene from an early build that I've played, for instance, is set in a hospital room on a night when Joel was severely dehydrated. Most of the gameplay, if you can call it that, involves clicking a mouse to move around the room and try to give Joel a box of juice to drink from. He continues to cry, seemingly uncontrollably. 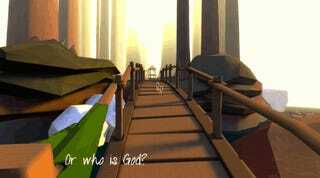 The scene ends with the player clicking a button so that Ryan begins to pray. Finally, Joel calms down again. Since the game is still in development, passages like this are rough around the edges. 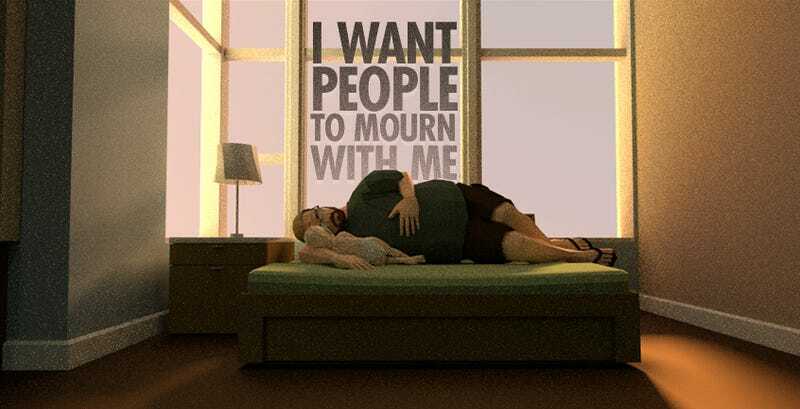 But when That Dragon, Cancer first began making its way to gamers at festivals and industry conventions in 2013, these demos still carried an unequivocally inspiring message that resonated with players and critics all the same: Joel was still alive, still beaming with excitement whenever he got a chance to cuddle with some puppies. He'd survived despite receiving a terminal diagnosis "before most children even learn to speak," Josh said during his talk. The story was tragic in a certain way. But it was not a tragedy at its heart. Then, the story changed. On March 13, 2014, a month before Josh came to speak at the Games For Change festival, Joel passed away. "Joel took his last breath at 1:52 AM," Amy Green, Joel's mother, wrote on a blog she and Ryan had made for their son the following morning. He was five years old. Ryan with his son Joel in an image posted on the family's personal blog when delivering the news of Joel's passing. Ever since Joel's initial diagnosis, Ryan and his family knew that his survival was a contingency—a bit of good fortune that wasn't necessarily going to last given the severity of his condition. But that didn't make his passing any less traumatic. As a devout Christian, Ryan admits that there were moments where he and his family questioned their faith. "The most emotional moments happen when we're all in the car," he told me over the phone at one point a few weeks after Josh's Games for Change presentation. In the middle of running errands or dropping his kids off somewhere, one of his other children would ask a pointed question about why God would let this happen to them. "It's a tough thing," Ryan said, "to believe in a God you don't see." He and Josh, along with the rest of the five-person team making That Dragon, Cancer, also faced a creative dilemma. Ryan had already told Joel's story in a number of different ways, for a number of different audiences: in the conversation he had with his other children about their brother's condition, in the updates on the website that Ryan and Amy had created for Joel, even in the initial articles that were written about the game. But the actual game That Dragon, Cancer, and the story within it, still isn't finished. Suddenly, tragically, one of its main characters had died. How does someone move on from that? Not just as a father and a husband—though that's hard enough as it is. But as an artist and a storyteller? And how do you do so as openly and nakedly as Ryan has? "I don't think we set out to be public," Ryan told me after I commented on how I was struck by how open he and his wife have been about practically every aspect of their personal life raising Joel. "It just sort of happened." But actually "being an artist in public" can leave him feeling uniquely vulnerable. "I want people to see Joel," he told me when describing the game. "I want people to mourn with me." The first time I interviewed Ryan was for a story I wrote almost exactly a year ago after meeting him and Josh as that year's Game Developer's Conference. At the time, he described his game in a similarly autobiographical, experiential way. "I'm asking you to walk along with me," he had told me back in the summer of 2013. "I want to show people what the face of fear looks like." Then, a moment later: "I want people to love my son like I love my son." The change in his words here—from inviting players to "walk along with me" to asking them to "mourn with me"—is telling. Both Ryan and Josh already knew they were trying to do something different with That Dragon, Cancer. Something that hasn't been done enough in games yet. They wanted to put players into another person's shoes, a real person's shoes, as they experienced something that could easily be overpoweringly emotional. But they also wanted to give players a genuine sense of hope, even faith. They still want to do that. But they also acknowledge that it might be more of a challenge to win over players, especially those who don't share their religious beliefs. "We wanted to take players through and say: 'look at everything we've gone through, and he's still here,'" Larson said to me one morning the week after Games for Change. "Now, that's not as convincing." The night after Joel's funeral, the two of them met along with other members of their team to take stock of the situation. Larson told me that through those conversations, they arrived at a new goal for the game: "to show what it's like to be with Joel." "That was a big change for us," he said. "A real change of direction." That renewed focus is part of what Josh had come to NYU to talk about. Like most of what I've seen about That Dragon Cancer, his presentation was thought-provoking and quivering with emotional sincerity. But I wouldn't call it "focused," exactly. If anything, he spent most of his time on stage outlining the immensity of the challenge that he and the other developers have placed before them in making this game. Making the game is a daunting task not simply because of the immediacy of the story, or the rawness of the emotions that its creators are living with right now. It's challenging because, as Josh explained in his talk, he and Ryan are actively trying to avoid many things that are considering standard, even essential, to modern video games. "How does one calculate a parent's love for a dying son who can't easily express love in return?" Josh asked at the outset. "In game design terms, the economics of this system don't seem to add up correctly." So rather than force the story to fit within a particular genre or form, they chose to forfeit the standards of game design entirely. There are no points to be added up in the game, Larson said. No quests to be completed. Enemies don't pop up just so you can shoot them down in one way or another. A karma system doesn't tell you whether your actions are good, or evil. They want players to have a degree of agency, "but not really one that allows them to change the game to their liking." After all, this is Ryan's story. We're to witness his testimony, not alter it as we see fit. Something about the combination of forthrightness and humility on display here has often inspired me. 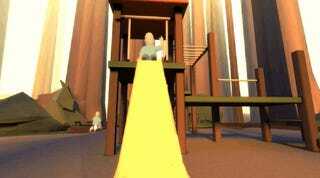 But at the same time, my chief concern with That Dragon, Cancer has always been what comes next—after Josh and Ryan have done away with the arbitrary restrictions they feel many other games impose upon themselves. In the second half of his presentation, Josh's focused on heady concepts like grace and love, without saying much about the specifics of what they actually mean for the game he's making. For all their openness, the one thing Larson and Green remained tight-lipped about whenever I talked to them came when I asked them about the nitty-gritty details of That Dragon, Cancer's actual gameplay. Instead, they kept returning to the big questions: about life, death, and faith, and how they're still trying to figure out how to tackle those things in their small game. This has frustrated me because while I've spoken to Josh and Ryan about their work many times, and even played sections of That Dragon, Cancer, I still don't really know what this game is. Other people—including some writing here at Kotaku—have played through the same early demos I have and related profound, heart-rending experiences. But these accounts of the game vary so much from mine that I have to wonder how much of themselves players are bringing into, or projecting onto, something that still strikes me as little more than a blank slate. The idea behind That Dragon, Cancer is undeniably affecting. But that's still just an idea. It's nothing to hold onto or sink your teeth into. And there have been too many indie games that have failed to make the requisite transition from a beautiful concept to something people want to actually sit down and play. The gravity of Green's story only makes this prospect seem all the more intimidating. That, and the fact that it's first going to be released as an exclusive for the Ouya, a game console that's been largely dismissed by gamers and critics alike so far in its short life on the market. That Dragon, Cancer is the kind of game I really want to succeed. At the same time, I can't help but wonder: how many people will see this game and recoil like the man sitting next to me at Games For Change did? Subjecting oneself to work that's so intimate and painful can be difficult. It's an especially daunting task for a video game, considering how close any piece of genuinely interactive work would put a player to the experience of grief. No wonder games rarely, if ever, hew this close to the bone when it comes to telling mournful stories. It's much easier to recover from the death of Joel's daughter in The Last of Us when you get to kill zombies for the next 30 or 40 hours. And that's not even a story about a real person's death. I laid these concerns out to Ryan and Josh as bluntly as I could in one of my last emails to them. Their response reminded me of what attracted me to That Dragon, Cancer in the first place. "I think it's ok to be unsure how it'll turn out at this point," Josh wrote back. "The game is not finished yet, so who knows." Yes, I thought, maybe the game is still more of a provocative idea than a substantive thing we can play. But is that really such a bad thing? Isn't that what the indie scene is best at: giving all us gamers new stuff to chew on, injecting provocations from the ground up? Ryan chimed in a few hours later. "I am inviting players in to see a perspective they might never have considered, or face their own source of doubt or struggle in their walk with faith, namely, 'how can I believe in a loving God when children get cancer and die?'" he wrote. "It's a question I ask myself every day, it's a question I have to wrestle with, it's a relationship that sometimes feels one-sided," he continued. "It's a topic I believe is worth exploring because I'm currently face-to-face with the reality of it." Like Josh, he also sounded rather bashful. "Now good intentions don't necessarily make good games," he continued. "I hope that we create something beautiful, and I'm hopeful it's worthy of praise because it is made with excellence and expertise." This was a few weeks after E3, when the hype and bombast of the mainstream game industry's largest event was slowly dwindling into the quiet lull of the summer. Just hearing someone fess up to his own doubt was surprisingly refreshing. Doing so takes courage, a tenacity that I wish more game developers had. "I am not yet an expert or a master craftsman," Green concluded. "Perhaps, like Josh said, God does want us to make this game, maybe if only to serve as an example of what not to do! Or maybe it will move people because it speaks to them right where they are right when they need to hear it." All the images from That Dragon, Cancer in this story were provided by Ryan Green. They are concept art created at different stages in the game's development, and are not necessarily representative of the final game that will be released for the Ouya.